Can the Chinese do Chinese to English translation well? Of course we can. Not anyone, though, I must hasten to add. I find this topic very thought-inspiring because it involves a key strategy that we should adopt in language study and translation. An uninformed answer to the question means that we might end up trying in vain to learn good English by translating from Chinese to English, one of the biggest pitfalls for us. The Chinese to English translations we can find, in most cases, are generally substandard and foreign-sounding (as to native English speakers). For example, the poorly done Chinese to English translations that are used as purportedly good examples in an authorized, genuine textbook of the official China Accreditation Test for Translators and Interpreters (CATTI). The users of such translations should feel embarrassed about having to settle for this below-par English language, knowing that the texts are just useful, convenient but not good enough to qualify as real English as used by respected native English writers. Really good Chinese to English translations are hard to come by. Bad Chinese to English translations should not be taken as good examples or subjects of study unless they are acknowledged as bad writing that we should avoid in our translation. Of course, I’m not saying that we cannot and should not do Chinese to English translation at all. In today’s quid pro quo, commercial world, it’s nonetheless a good and profitable idea to do it if you are convinced you will get paid for whatever you will be able to achieve in translating from Chinese to English. However, we must understand that the client chooses us for the job for some reason. Perhaps, they simply do not want or need perfect English. Or they are left with no other choices but to reluctantly content themselves with second- or third-rate English because good native English-speaking Chinese to English translators are not available. It makes us thrilled to see that so many new and returning clients keep coming to us to buy our Chinese to English translations. For many of us, this is treacherously illusive. We feel important. But, we would nonetheless be quite mistaken if this makes us believe in the slightest that we can do it really well. Of course, nothing is absolute. Who knows you cannot be, for example, the next Lin Yutang? With talent and hard work, we can eventually write English as good as admired English writers. But, again, not anyone. As I see it, the only way to make it is through reading, studying and absorbing the first-class Chinese and English prose by the best writers. If we turn a blind eye to the truly good native English or Chinese and rest and are thankful for alien-sounding English that should not be taken as example in the first place, we are heading in the very wrong direction. A more detailed discussion of the right approaches we should adopt to learning languages can be found under “A Wrong Way of Learning Translation” in my earlier blog post titled Learning Strategy: English as frontier and Chinese as base (英语学习方略：以英语为新天地，以汉语为根据地). This recurrent topic crops up again in my blog because it seems that quite a few people think Chinese to English translation is a shortcut to good English. 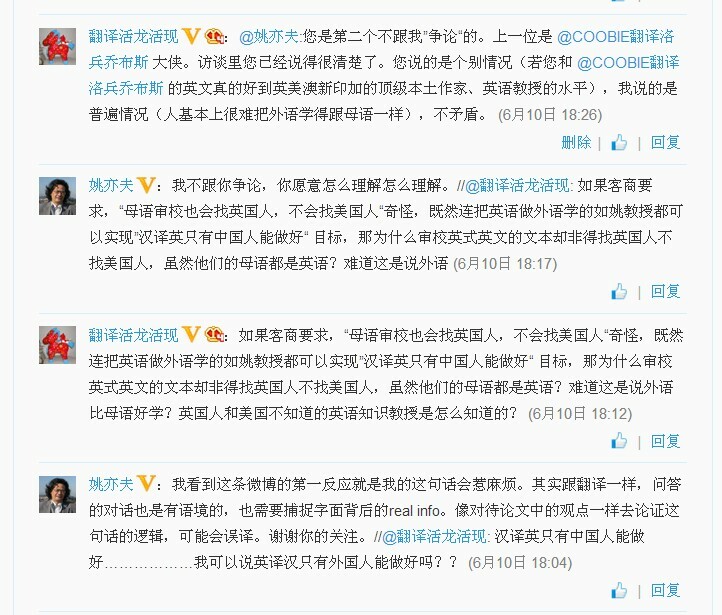 Even some high-profile and respected university teachers and professors claim that “the Chinese people can do Chinese to English translation well” and at least one of the them, Professor Yao Jinqing (姚锦清) (Weibo: @姚亦夫) of Shanghai International Studies University, has gone so far as to say that “only Chinese can do Chinese to English translation well“. Perhaps these claims were merely quoted out of context and were not what they meant to say. As some people say, however, words are like arrows; once shot, they can never be retrieved. The claims are misleading to new and old English learners and translators who use English as foreign language. For them, these claims just give them unrealistic dreams that they will never be able to realize. Therefore, I feel a strong need and an urgent case to give this question a clearer answer and ensure that there is no misunderstanding. Question: Can the Chinese people do Chinese to English translation? Or, if yes, how well can we do it? Answer: Only Chinese can do Chinese to English translation well and I’ve done this all my life. There are very few foreigners who can do it well. Howard Goldblatt (葛浩文) can do it well, but in another way. What he does it is re-creation. Only the Chinese people can do it [well] if it involves everyday practical writing. Firstly, this is because Chinese is too difficult and too complex as a language. Secondly, many concepts must not be gotten wrong. For example, when asked by the State Council’s press office to translate [the subtitles of] a video, a foreign translator translated “go to Taiwan” into “go abroad”, which is a mistake in matters of principle. Question: Does the School provide translation study programs other than the language pair of Chinese and English? For example, do you have any study and training programs involving different English variants, such as British, American, and Australian, and different Chinese variants, such as those used in the Mainland, Hong Kong, Taiwan, and Singapore? Or do you provide programs related to one of them? Yao: From the practical point of view, this issue truly exists. Usually, what we do is translation intended for foreign audience and it is written in Global English. So this issue does not exist. However, some clients have British business partners, who want British English translations. In that case, British native speakers instead of American ones will be asked for help in native English editing and review. To continue this discussion, I must assume that the professor meant what he said. And I will understand his words in the usual way – the native way. Otherwise, this discussion could not continue. I must say that it’s a shocking claim, “Only the Chinese can do Chinese to English translation well“. In line with the same logic, can I go on to say that “only foreigners can do English to Chinese translation well”? The arguments can be the same: English is too complex and its concepts must not be gotten wrong. But, according to Professor Yao, if the client demands, “British native speakers instead of American ones will be asked for help in native English editing and review.” But wait. Hasn’t he also said that “only the Chinese [foreigners] can do Chinese to English translation well“, too? Why not let us do it for the British business? Why on earth cannot the American editor do the editing well even though British and American editors speak essentially the same language? Does Professor Yao mean that it’s easier to learn a foreign language than to learn a dialect of the language whose standard form its speakers use as their native language? How did the Chinese as foreigners manage to acquire the language knowledge and capabilities English-speaking American or British editors have failed to acquire? It’s really hard to believe that for the Chinese speakers in northern China it’s easier to learn English than to learn, for example, a northern dialect used in Northeast China, where I grew up. In other words, what has been clearly written down in black and white and might have qualified as sworn evidence before a judge can be easily explained away by simply saying that “it’s not what I mean”. However, everyone should be taken accountable for what they have said. 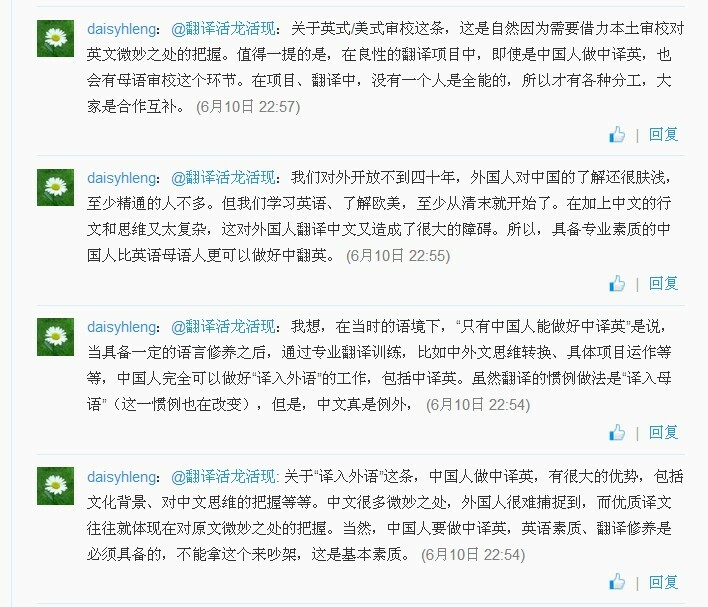 If Professor Yao has been indeed misrepresented in the transcribed Q&As, the misrepresentation should be corrected. Otherwise, it might result in misunderstanding by unsuspecting and unwary audience. This has already occurred, as shown in the comments that expressed full agreement below the original post. But, as I see it, he was just finding it hard to try to reconcile what he said with what he meant. “Only the Chinese can do Chinese to English translation well“. This is actually a two-part claim: translation as a process and as a result. They in turn can translate into two jobs: reading comprehension and writing. Understanding Chinese is what we are good at, but writing in English is what they are good at. Professor Yao can guarantee that his Chinese reading comprehension is of native level. But can he also be so sure that his English writing is also as good as native English-speaking writers or editors, for example, those university instructors, professors, and doctoral supervisor in Great Britain, America, India, Canada or Australia? Even if he can, which will make him a worthy writer even before Lin Yutang, he is one of the exceptions and by definition exceptions do not change the law: very few people can learn a foreign language well (as well as native speakers). Then it logically follows that most translators, when translating from their native language to a foreign one, can only produce translations of very dubious linguistic quality. 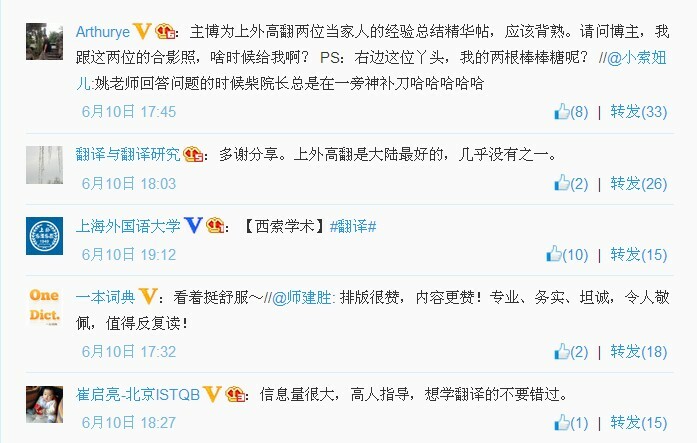 Someone argue that Chinese as a language is too difficult for foreigners to learn well or that Chinese is an exception. These claims do not hold water and smack very uncomfortably of racial or linguistic discrimination. Languages are complex and are special in their own way by nature. Neither Chinese nor English is an exception. For example, it’s really hard for us to understand that the U.S. President Obama would have been forced to apologize for saying something we might quite happily agree with: “California’s Kamala Harris is the best-looking attorney general in the country“. However, this remark can be considered sexist and thus unacceptable by some in the United States, something I can hardly imagine. It’s people who write and understand. How well they do depends on their language capabilities, not on the perceived difficulty of a certain language. If you are slow to understand, do not blame it on the writer. Of course, it cannot be ruled out that the writer does not write clearly enough. That’s another question. For that matter, understanding that “the writer does not write clearly enough” is just another form of “understanding”, of “knowing”, which is also part of the language capabilities. Native language is a comprehensive thing. It is emotional. It is felt in your bones. And it runs in your blood. It’s also inseparable from the environment where it thrives. Writing is only part of language capability and speaking is primary though it appears elementary. But writing and speaking are just two sides of the same coin: good native language. One couldn’t live without the other. Without long-time, full and deep immersion in the native language environment, it is very difficult for a foreigner to learn and understand all the key non-linguistic aspects of a language: political, economic, social, technological, historical, geographical, demographic, ethnic, etc. This list runs very long. Most English learners and translators in China do not have the opportunity to live and work in an English-speaking country. Though today’s communication technologies seem so advanced that all the learning materials can be just a few mouse clicks away, they can only solve only some of the problems. After all, nothing is as good as personally being in an English-speaking country and being part of it. Translating from English to our native Chinese seems a simple enough a job: understand the original English texts and then write down in Chinese what you’ve understood. Good translators can do the two steps well. But not always. They can accidentally mistake some words for others, or simply just fail to write well what they’ve understood. However, when it comes to “I just did not write it well enough though I perfectly understand every word of the original text”, my observation is that there are two scenarios: You understood it and you did not at all. The latter prevails. Only Americans can do English to Chinese translation well and I’ve done it all my life. There are very few Chinese people who can do it well. 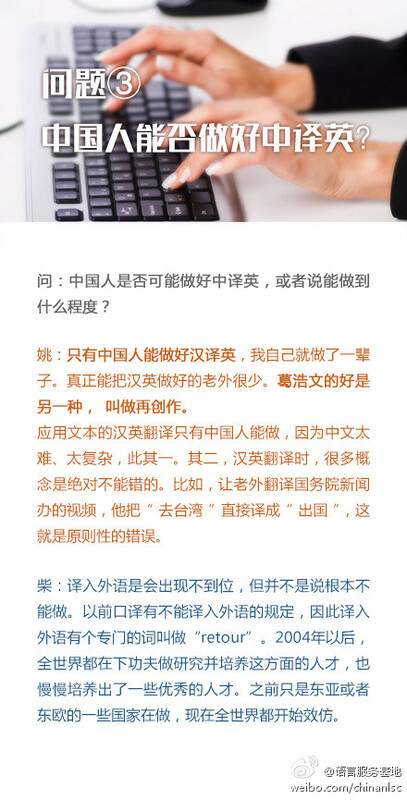 Yu Guangzhong (余光中) can do it well, but in another way – we call it creative translation. Only Americans can do a good job if it involves everyday practical writing. Firstly, this is because English is too difficult and too complex as a language. Secondly, many concepts must not be gotten wrong. For example, when asked by the U.S. Department of State’s press office to transcribe and translate a video, a Chinese translator translated “go to continental Europe” into “go to Europe”, which is, strictly speaking, a geographical mistake. If there is indeed such an American genius (both possible and probable, of course), I want very much to get to know him or her and to see how he or she has managed to do English to Chinese translation better than I do – though I’m just one of the many industry-average English to Chinese translators who flatter ourselves by thinking that we are good at our work. There are certainly much better ones, like Yu Guangzhou I’ve mentioned above. ** This is also dog-food-style, second- or third- or fourth-rate English writing, the kind I’ve warned you against if you’re looking for really good English. 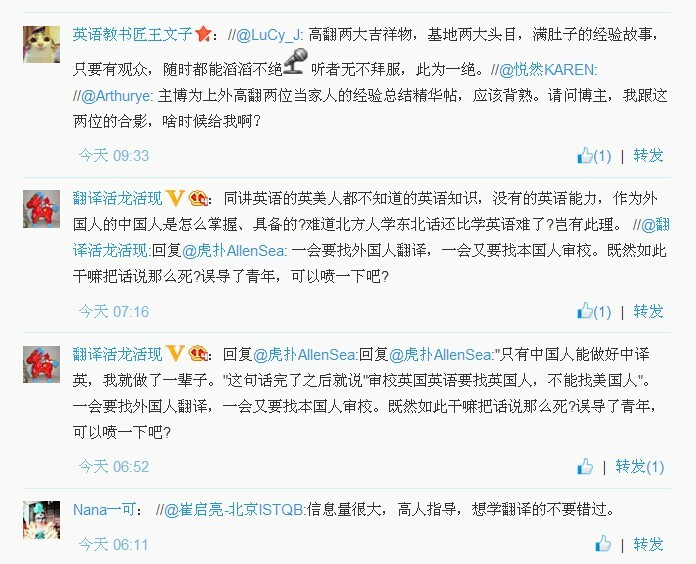 I was arguing that it’s very difficult, if not impossible, for the Chinese to do Chinese to English translations that are of native level linguistic and industry quality. Very few can do this, but most others are given false hopes by those misleading claims. Sorry I didn’t quite understand “I find you writing is better than your language of the English translation text , which may interestingly prove that, never improve your English simply by translation, but total immersion into the language. ” Can you please elaborate?